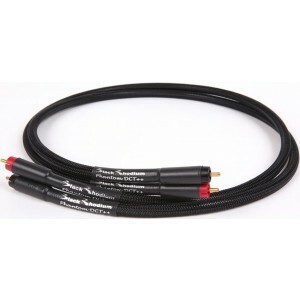 Using tightly twisted, silver plated solid core cable, the Black Rhodium Phantom DCT++ are high performance RCA interconnects offering deep cryogenic treatment (DCT) terminated with Eichmann Bullet plugs offering stunning performance at a mid-price. Phantom DCT++ utilises some of the same advanced production techniques as Black Rhodium's higher cables, ensuring this cable offers excellent value for money. Utilising high quality PTFE insulation with an exclusive post production process which allows for a faster, clearer beat and a smoother sound, less prone to harshness. Double braided silver plated copper screen, which rejects RFI interference, and offers another benefit to clearer sound, and reduced background noise. The Eichmann Bullet Plugs, which due to their single point return contact and 24k gold plating, this improves the clarity and cleanliness of sound. The cable is treated with our advanced Deep Cryogenic Treatment DCT++ process that adds improvements to depth, clarity and timing of audio and visual. The additional processes before and after DCT in the DCT++ process take these improvements to a much higher level. Directional heat shrinks are applied to the attractive jet black sheath. This ensures that you can achieve the full benefits from this directional, aesthetically pleasing cable, due to its ease of use.